She also displayed knowledge about Chinese literature by reciting Three Character Classic, a Confucianist volume to educate young children, and two ancient poems of Li Bai, Watching the Fall of Lushan Mountain, and Departing from White King City in the Morning. 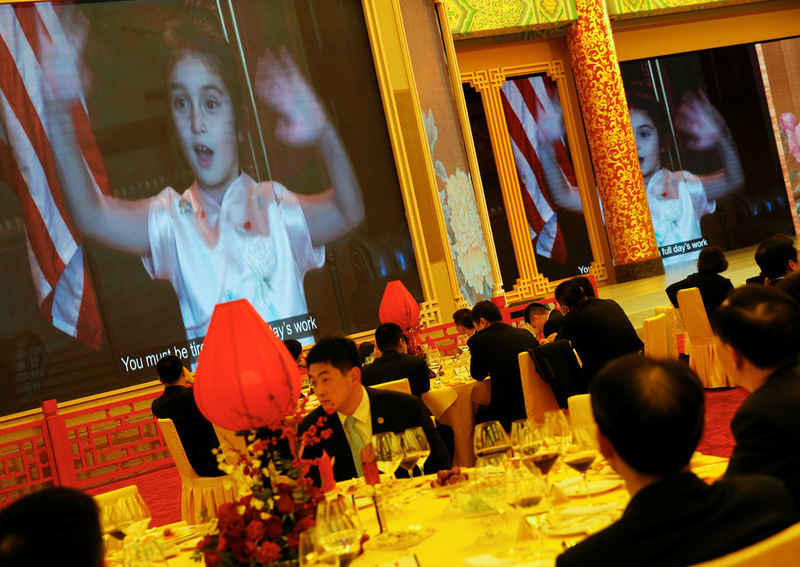 Earlier this year, during President Xi's visit to the United States, Arabella has already performed for the president and his wife at the Mar-a-Lago resort in Palm Beach, Florida, on April 6. Standing alongside her parents, Arabella sang Jasmine, a Chinese folk song with her brother Joseph. US President Donald Trump chats with Russia's President Vladimir Putin as they attend the APEC Economic Leaders' Meeting, part of the APEC leaders' summit in the central Vietnamese city of Danang on November 11, 2017. President Donald Trump speaking with Russian President, Vladimir Putin as host country's Vietnamese President, Tran Dai Quang walks alongside as they make their way to the area designated for the APEC Family photo at the Intercontinental Da Nang Resort. US President Donald Trump (L) shakes hands with Russia's President Vladimir Putin (R) as they pose for a group photo ahead of the Asia-Pacific Economic Cooperation (APEC) Summit leaders gala dinner. Australia's Prime Minister Malcolm Turnbull (R) taking a selfie with Vietnam’s President Tran Dai Quang (L), US President Donald Trump (2nd L) and China's President Xi Jinping as they attend the APEC Economic Leaders' Meeting. President Donald Trump walks away with Indonesia's President, Joko Widodo as Japan's Prime Minister, Shinzo Abe walks behind them while they leave the designated area for the APEC Family photo at the Intercontinental Da Nang Resort. (Bottom L-R) South Korea's President Moon Jae-in, Malaysia's Prime Minister Najib Razak, Mexico's President Enrique Pena Nieto, (top L-R) Singapore's Prime Minister Lee Hsien Loong, New Zealand's Prime Minister Jacinda Ardern. (Front L to R) China's President Xi Jinping, Vietnam's President Tran Dai Quang, Indonesia's President Joko Widodo, Japan's Prime Minister Shinzo Abe, (back L to R) Philippine President Rodrigo Duterte, Russia's President Vladimir Putin, US President Donald Trump and Thailand's Prime Minister Prayut Chan-O-Cha. US President Donald Trump (2nd L) chatting with Vietnam’s President Tran Dai Quang (R) and Mexico's President Enrique Pena Nieto (2nd R). Trump arrived in Hanoi after attending the Asia-Pacific Economic Cooperation (APEC) Summit leaders meetings earlier in the day in Danang. U.S. President Donald Trump and first lady Melania Trump depart after a state dinner in their honour. First Lady Melania Trump, US President Donald Trump, China's President Xi Jinping and his wife Peng Liyuan at the Forbidden City in Beijing on November 8, 2017. The US president is on a three-day visit to China as part of his Asian tour. U.S. President Donald Trump takes part in a welcoming ceremony with China's President Xi Jinping in Beijing, China, November 9, 2017. The leaders shake hands after making joint statements at the Great Hall of the People in Beijing on Thursday. US first lady Melania Trump and Chinese first lady Peng Liyuan, hold up Chinese calligraphy of the character for "Fortune" written by students during a visit to the Banchang Primary School in Beijing. US President Donald Trump's attempt to make an unannounced visit to the heavily fortified border separating North and South Korea was aborted on Wednesday after dense fog prevented his helicopter from landing, officials said. Trump was disappointed he was unable to visit the DMZ, which was planned secretly to show the strength of the US-South Korean alliance, said White House spokeswoman Sarah Sanders. White House press secretary Sarah Huckabee Sanders speaks to reporters after presidential helicopters returned US President Donald Trump to US Army Garrison Yongsan in Seoul, South Korea on Nov 8. U.S. President Donald Trump sits in his car after being grounded from an attempt to visit the Demilitarized Zone (DMZ) in the truce village of Panmunjom dividing North Korea and South Korea. US President Donald Trump was served traditional Korean dishes at a state dinner Tuesday, attended by some 120 other guests representing the two countries' close relationship in the areas of diplomacy, business, culture and security. US President Donald Trump was served traditional Korean dishes at a state dinner Tuesday, attended by some 120 other guests. A selection of appetisers is set at each guest's place. The main dish was Korean beef ribs marinated in a special soy sauce with the Korean traditional dish Japchae, or stir-fried glass noodles, with prawns from the country's easternmost islets of Dokdo. Grilled sole, said to be one of President Trump's favorites, was also on the dinner table, which was decorated with the concept of an imperial court in Korea with fabric flowers made of silk and ramie cloths. For dessert, a rich chocolate cake garnished with raspberry vanilla sauce and Sujeonggwa, or cinnamon punch, a traditional Korean drink, were served. Melania Trump meets Minho of pop group Shinee, but it's a stunned schoolgirl who steals the show. Her shocked reaction prompted bemused smiles from the pop singer and US First Lady. US President Donald Trump arrived in Seoul on Tuesday (Nov 7). He was welcomed by South Korea's President Moon Jae-in at the presidential Blue House. A special sauce more than a century older than the United States will be on the menu for Donald Trump at his state banquet in Seoul on Tuesday. Trump also visited the US Eighth Army Operation Command Center at US military installation Camp Humphreys in Pyeongtaek, South Korea. Supporters of Trump display US and South Korea flags while waiting for Trump's motorcade to pass in central Seoul. The guest book signed by Trump and first lady Melania is pictured at South Korea’s presidential Blue House in Seoul. Trump's stay in Seoul will last approximately 24 hours, the shortest in his five-nation tour. Due to time constraints, the US leader has decided to skip a trip to the Demilitarised Zone (DMZ). The two previous visits in June 1998 and May 1999 were arranged by the now-defunct Daewoo Group here, which General Motors acquired in 2002. First Lady Melania Trump will accompany her husband to South Korea, although little is known about her planned schedule there. During his visit in the summer of 1998, Trump toured a shipyard and car factory under Daewoo Group. Handshake between US President Donald Trump and S Korean President Moon Jae-in. US President Donald Trump said he would "certainly be open" to meeting with North Korean leader Kim Jong-Un. "I would sit down with anybody," he said. "I don't think it's strength or weakness, I think sitting down with people is not a bad thing. US President Donald Trump kisses First Lady Melania Trump upon arriviing in Osan, South Korea. US First Lady Melania walks beside a US secret service agent upon arriving with her husband US President Donald Trump (not pictured) in Osan, outside of Seoul. Melania Trump signs a guestbook at the Blue House in Seoul. US First Lady Melania Trump (L) and Kim Jung-sook, wife of South Korea's President Moon Jae-In. Anti-Trump protesters hold placards and shout slogans as they wait for the convoy of US President Donald Trump to make its way past, in Gwanghwamun square in central in Seoul. US president Donald Trump met Japanese Internet sensation Pikotaro, known for his "pen-pineapple-apple-pen" tune that went viral last year, on Monday (Nov 6) night. "President Trump and Prime Minister Abe ," he wrote. "It is an honour!" Trump's grandchildren are reportedly fans of the star. Photo caption: Pikotaro at the official dinner thrown by Japan's Prime Minister Shinzo Abe in honor of U.S. President Donald Trump at November 6, 2017. White House Communications Director Hope Hicks made her own high fashion statement during a Japanese state dinner in Tokyo Monday night. US President Donald Trump sparked a feeding frenzy on social media on Monday (Nov 6) when he was photographed dumping a box of fish food into a pond of koi carp during his trip to Japan. US President Donald Trump touched down in Japan Sunday, kicking off the first leg of a high-stakes Asia tour set to be dominated by soaring tensions with nuclear-armed North Korea. U.S. President Donald Trump walks with Japan's Prime Minister Shinzo Abe as he arrives at Akasaka Palace in Tokyo, Japan, November 6, 2017. Trump and his “friend” Shinzo Abe, Japan’s prime minister, enjoy a close personal relationship and the three-day Japan leg of the trip is noticeably relaxed, with the two leaders teeing off for a round of golf before being serenaded by wacky internet sensation Pikotaro. US President Donald Trump (R) and Japanese Prime Minister Shinzo Abe (L) review the honour guard during a welcoming ceremony in Tokyo on November 6, 2017. U.S. President Donald Trump greeted Japanese Emperor Akihito and Empress Michiko on Monday with a genteel handshake and nod, but no bow, avoiding the pitfall of U.S. President Barack Obama who was criticised at home for his deep bow to the monarch. US President Donald Trump (R) talks with Japan's Emperor Akihito (L) during their meeting at the Imperial Palace in Tokyo on November 6, 2017. US first lady Melania Trump (L) talks with Japan's Empress Michiko (R) at the Imperial Palace in Tokyo on November 6, 2017. Japan's Emperor Akihito sees off US President Donald Trump after their meeting at the Imperial Palace in Tokyo on November 6, 2017. US President Donald Trump (C-L) and Japanese Prime Minister Shinzo Abe (C-R) feed koi fish during a welcoming ceremony in Tokyo on November 6, 2017. US First Lady Melania Trump writes calligraphy while attending a calligraphy class of 4th graders with Akie Abe (R), wife of the Japanese prime minister, at the Kyobashi Tsukiji elementary school in Tokyo on November 6, 2017.